aiCurrency, full name is Android Currency, is a currency converter for 203 currencies. 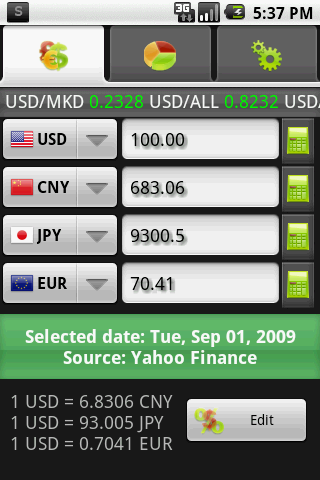 Android Currency uses exchanges rates used by Yahoo Finance, National Bank of Ukraine and European Central Bank. It provides wide range of features like automatically updated exchange rates, multiple currencies conversions, course dynamics for last 90 days, desired decimal precision (from 0 to 5 decimals). The currency converter is simple to use. ...... The currency converter allows also examine the rate of exchange for last three months from the date of the last update. Such wide range of services will be helpful in your everyday actions. * Layouts improved for Android 2.0. Supported all devices resolutions. CurrencyManage Paper Money Collecting Software. A simple currency calculator which can convert about 200 world currencies . Qweas is providing links to Android Currency 1.2 as a courtesy, and makes no representations regarding Android Currency or any other applications or any information related thereto. Any questions, complaints or claims regarding this application Android Currency 1.2 must be directed to the appropriate software vendor. You may click the publisher link of Android Currency on the top of this page to get more details about the vendor.